Want to create a book about your ancestors, but don't have a clue where to start? Start with a simple pedigree chart. At Rootstech last month, a woman stopped me in the hall after my presentation and told me she wanted to create a book about her ancestors, but she didn't have any idea how to organize it. How many generations to include? What if she had more information about some ancestors and very little about others? What order should she put it in? Fortunately, I had an easy answer for her. "By the numbers," I said. A standard pedigree chart is usually numbered in a straightforward way: five generations equals 31 direct-line individuals. The first generation (you or your subject) is #1; your parents are #2-3; grandparents #4-7, great-grandparents #8-15; great-great-grandparents #16-31, and so on. A five-generation chart, numbered from 1 to 31. The numbering system on a standard pedigree chart holds the perfect clue to organizing your family history book. 1. Choose a finite number of generations on which to focus. In the immortal words of Dr. Seuss, "Shorth is better than length." If you have a lot of stories and pictures and data to include, stick to four or five generations per book, and perhaps choose one line at a time. This will make a manageable-sized book, which will be more likely to be read and enjoyed than a huge doorstop with your entire lineage back to royalty. You can create subsequent volumes as you go further back or delve into collateral lines. Focus on a single line or a finite number of generations to display in your book. This book is limited to four generations. 2. Display the numbered pedigree in the beginning of the book as a reference; better yet, you can even show the chart again at the start of each section, with that ancestor's name and number highlighted on the chart. Display the ancestor's pedigree chart number prominently to keep your reader from getting "lost." 3. Do include pictures and stories with your genealogical data. I know, we sound like a broken record, but if you want your book to be enjoyed and savored, not put on a shelf as reference material, you need to make it engaging and attractive. What if you don't know much about the person? It's okay, just use what you have—a picture of a gravesite, text from an obituary, or even a map of where they lived is more interesting than a name and a date alone. If you have more about an ancestor, include more. You don't have to make it all "even." Photos, if you have them, with captions, will bring the genealogical data to life. 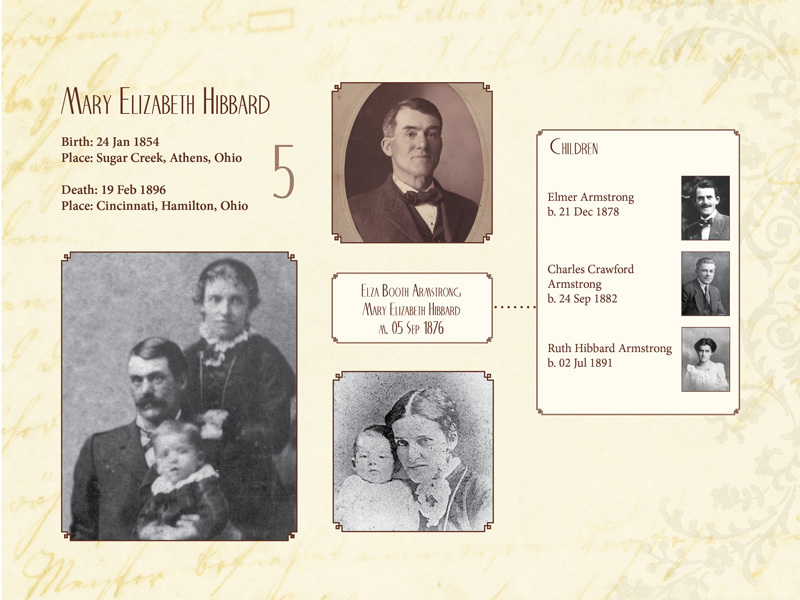 A stylized "family group sheet" shows information about this couple's children. Stories, additional pictures and obituaries of this couple and their children appear on subsequent pages. 6. Don't wait until all your research is complete! Just accept the fact that genealogical research is never "done." It's the nature of the beast—as soon as the ink is dry on your book, you will find some other nugget you wish you could have added. The great thing about short-run digital printing is that you can easily add information before a reprint, or you can create a second volume or update index book next year. After I finished the first edition of my grandfather's book, above, I found a lot of great information about our family's Scots origins and decided to include that in a section in the back in a subsequent printing. Next post—Part Two, we will show you how to create a descendancy book.